I have a running list of books that people have recommended that I read. My friend Trilby Jeeves suggested I read Daniel Pink’s A Whole New Mind, and boy, was I glad I did. We all know that our brains are comprised of two hemispheres: the left, and the right. The left is responsible for reasoning and deduction, and the right is responsible for emotions, empathy and creativity. Ever since grade 3, it has been clear to me that I am right-brain dominant. Math has always been my nemesis, and even now, in the day-to-day operation of my business, my Excel spreadsheets come from a place of needing to be in control, rather than a pure joy of numbers and order. I love words, reading, writing and acting, and to be spontaneous and creative. Here’s the thing about being predominantly right-brained: the kinds of careers that suit us right-brainers; artists and nurses, for example, tend to be of the lesser-paying and (to many) less-prestigious professions, like, say lawyers, accountants, or Bill Gates. But the world is changing. Work that used to be only done here in North America or in Europe is now being outsourced to well-educated people in emerging countries, like India, because it is way, way cheaper. Also, technology is getting so good, that a computer can often do work that took many brains to do, faster and with less error. Finally, we live in a land of plenty–most people now have enough money to fulfill the lower levels of Maslow’s Hierarchy–food, shelter, safety. It’s for these reasons, Pink says, that the sun is setting on the day of the left-brainer. It is no longer good enough to be technically adept. My favorite example that Pink uses is that of Doctors. They go to school for many years, and learn how to diagnose and treat medical ailments. This is an incredibly left-brained profession. But think about doctors that you have had interacted with in the past. Which did you prefer: the ones that treated you (even if they were right) in a perfunctory manner, or ones that treated you with empathy, knew your name, and spent a little more time? Pink doesn’t advocate that doctors give up their professions and become clowns. But what he does maintain is that people who were previously doing really well in left-brained professions need to incorporate some right-brained traits into their jobs to make them better and to be able to survive in this heavily-competitive market. Pink talks about six new right-brained “senses”: design, story, symphony, empathy, play and meaning. What I love the most about his book is the “portfolio” section that follows each of the chapters on the above topics. It gives you great, specific, and tangible ideas to help yourself to get better in each of these areas. One of the things that Trilby does is teach people (even corporate, left-brained people) a specific kind of clowning called bouffon. That is an incredible way for a right-brained person to make a living in this new, conceptual age. UPDATE: I just learned that Trilby has also written a blog post on the book: click here to read it. 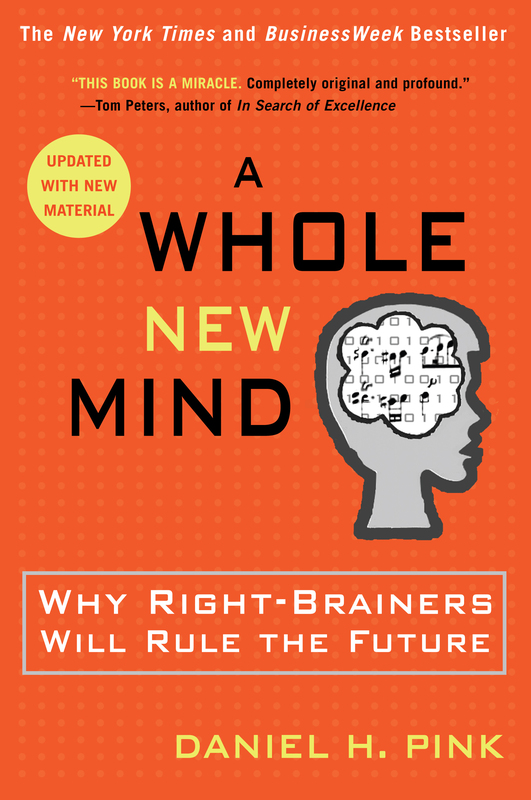 Whether you are predominantly right-brained, or predominantly left-brained, this is a great book, and I’m certain you will find it helpful and empowering. This book has been in the back of my mind since I read about it on The Mission Paradox blog. Thanks for putting it back to the front.